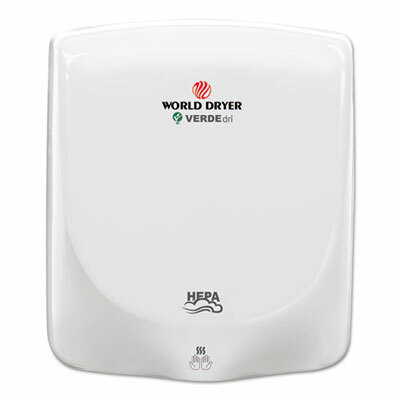 Hand Dryers with compact size design are affordable for sound sensitive areas. It is economical washroom solution for low to medium traffic facilities. Material(s): Aluminum; Color(s): White; Width: 9"; Depth: 9 3/4�. 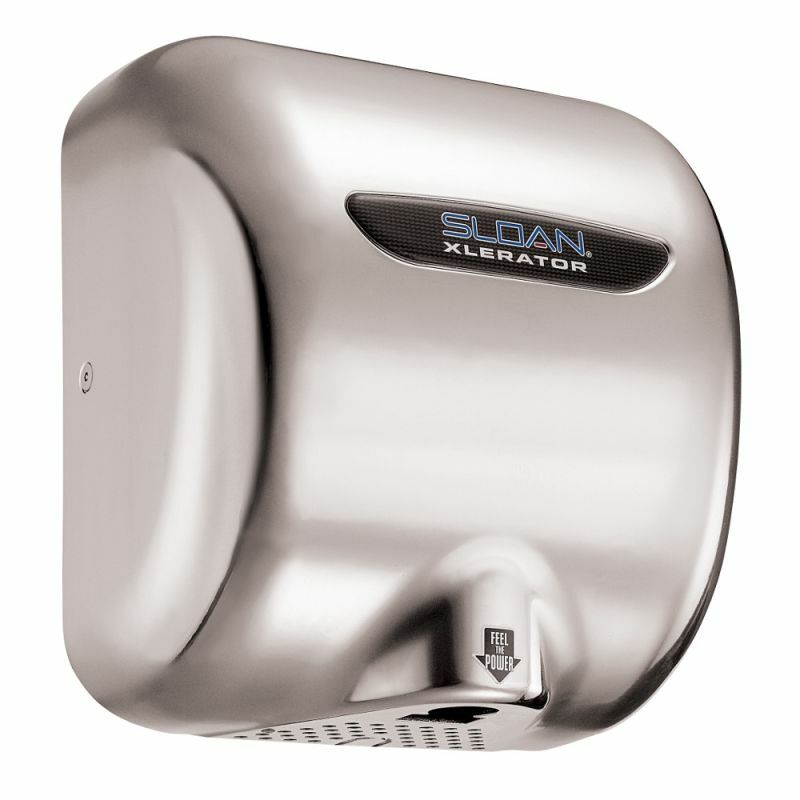 SMARTdri� Series high-speed hand dryers are the most energy efficient, durable and hygienic hand dryers on the market today. 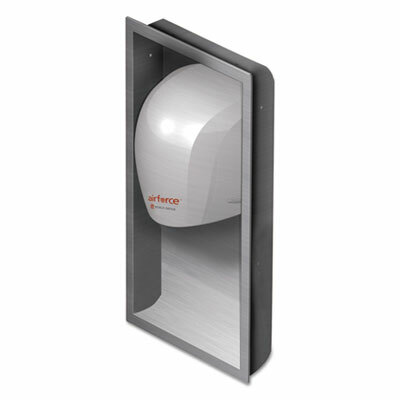 SMARTdri's proprietary motor technology offers the longest service life of any high-speed hand dryer. The intelligent, flexible controls allow customizing of air flow, sound quality and heating options to fit any application. For user comfort. Material(s): Stainless Steel; Color(s): Brushed; Width: 12 1/2"; Depth: 9 3/8". Features 15 second dry time, energy efficiency, ADA compliance and a surface mount. 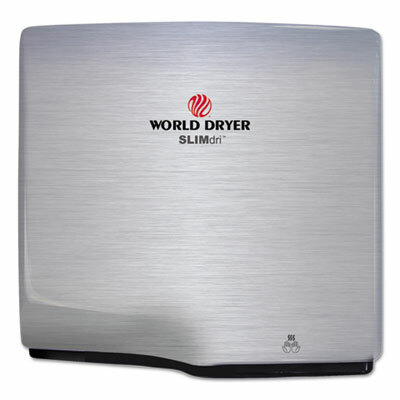 The SLIMdri hand dryer is perfect for all commercial washrooms. The On/Off heating control, stylish low-profile design with flexible cover options and universal voltage features fits any d�cor or washroom environment. Material(s): Aluminum; Color(s): White; Width: 13 7/8�; Depth: 13�. 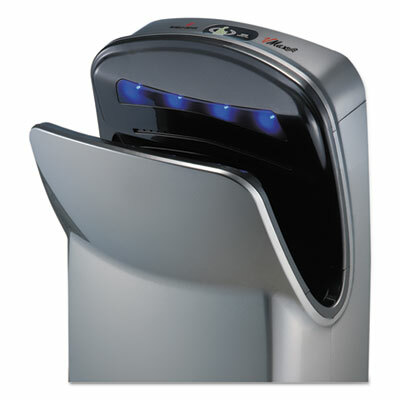 SMARTdri� Series high-speed hand dryers are the most energy efficient, durable and hygienic hand dryers on the market today. 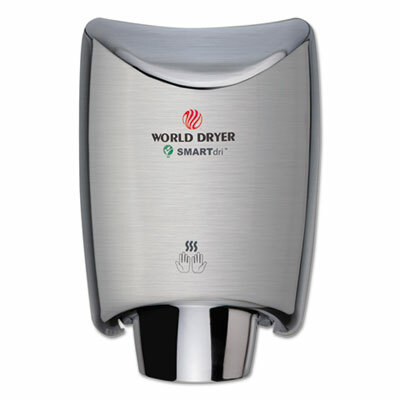 SMARTdri's proprietary motor technology offers the longest service life of any high-speed hand dryer. The intelligent, flexible controls allow customizing of air flow, sound quality and heating options to fit any application. For user comfort. Material(s): Aluminum; Color(s): White; Width: 12 1/2"; Depth: 9 3/8". Optional recess kit is available for ADA compliance. Brushed stainless steel finish. Hand dryer sold separately. Height: 25"; Length: 15"; Width: 4"; Weight: 8.4 lbs. Features high speed 12 second dry time, ADA compliance and a surface mount. 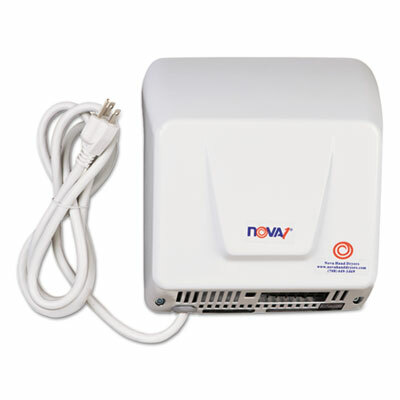 Includes HEPA filtration system and antimicrobial technology. VERDEdri is extremely energy efficient utilizing only 950 watts of power. The adjustable two speed motor controls and global universal voltage features accommodate any commercial washroom environment. Material(s): Stainless Steel; Color(s): Brushed; Width: 13 3/8�; Depth: 11 3/4�. Optional adapter kit for top-entry conduit. Brushed stainless steel finish. Hand dryer sold separately. Height: 13 1/2"; Length: 14 3/8"; Width: 1 1/4"; Weight: 3.8 lbs. Features 15 second dry time, energy efficiency, ADA compliance and a surface mount. 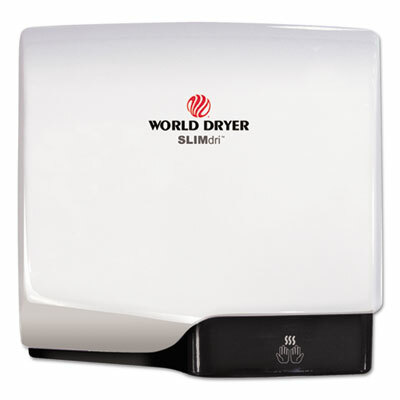 The SLIMdri hand dryer is perfect for all commercial washrooms. The On/Off heating control, stylish low-profile design with flexible cover options and universal voltage features fits any d�cor or washroom environment. Material(s): Stainless Steel; Color(s): Brushed; Width: 13 7/8�; Depth: 13�. 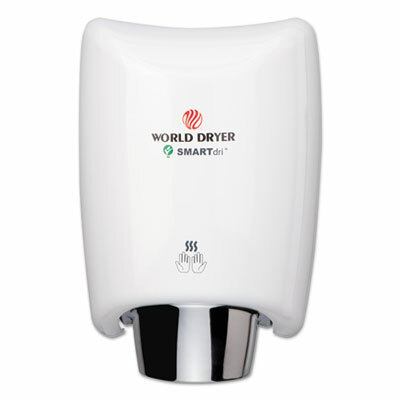 SMARTdri� Series high-speed hand dryers are the most energy efficient, durable and hygienic hand dryers on the market today. 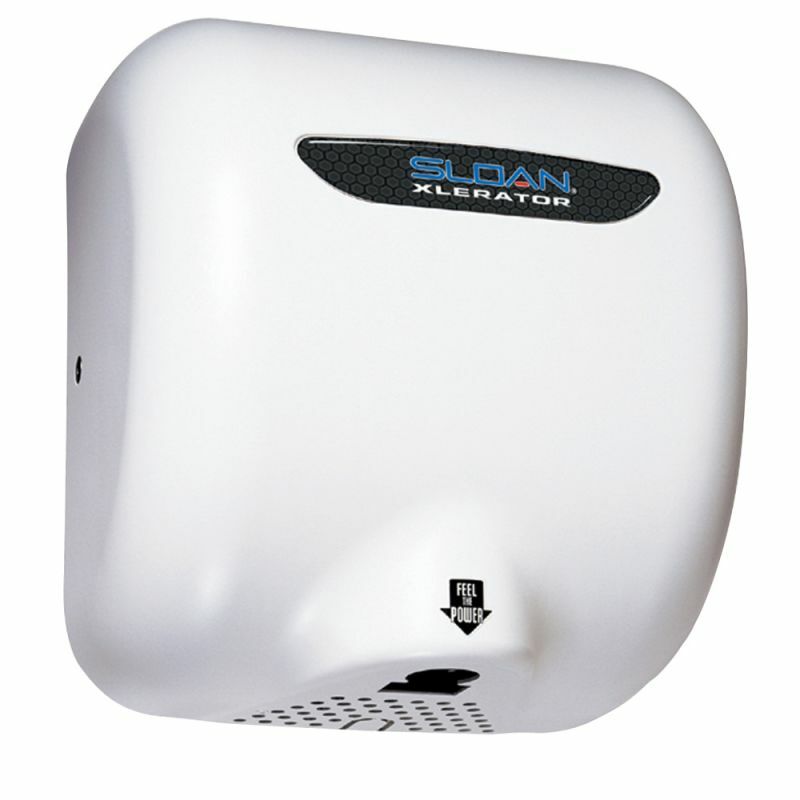 SMARTdri's proprietary motor technology offers the longest service life of any high-speed hand dryer. The intelligent, flexible controls allow customizing of air flow, sound quality and heating options to fit any application. High intensity. Material(s): Aluminum; Color(s): White; Width: 12 1/2"; Depth: 9 3/8". Optional recess kit. Brushed stainless steel finish. Hand dryer sold separately. Height: 25"; Length: 15"; Width: 4"; Weight: 8.4 lbs. 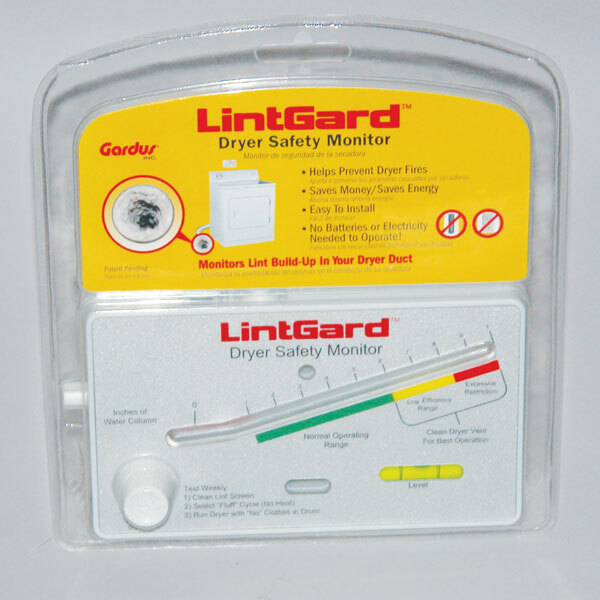 Features high speed 12 second dry time, ADA compliance and a surface mount. Includes HEPA filtration system and antimicrobial technology. VERDEdri is extremely energy efficient utilizing only 950 watts of power. 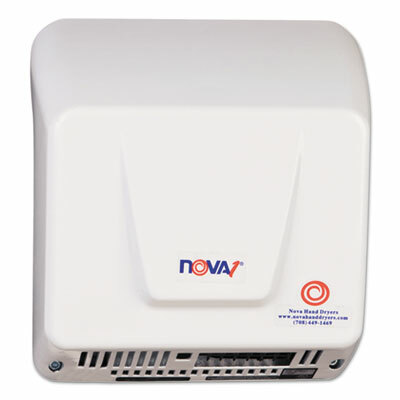 The adjustable two speed motor controls and global universal voltage features accommodate any commercial washroom environment. Material(s): Aluminum; Color(s): White; Width: 13 3/8�; Depth: 11 3/4�. 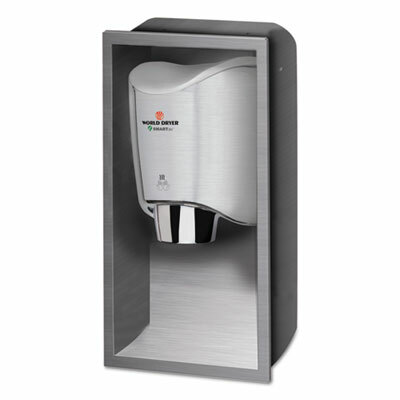 VMax� is a "hands in" vertical style high speed hand dryer featuring a HEPA filter system, wider hand drying cavity opening and antimicrobial technology. Dedicated water collection reservoir eliminates water from collecting on the floor resulting in reduced maintenance. Polarized plug makes installation easy and eliminates the need to hard wire. Quiet operation is ideal for sound sensitive areas. Material(s): High Impact ABS; Color(s): Silver; Width: 26 1/4"; Depth: 9 1/4". 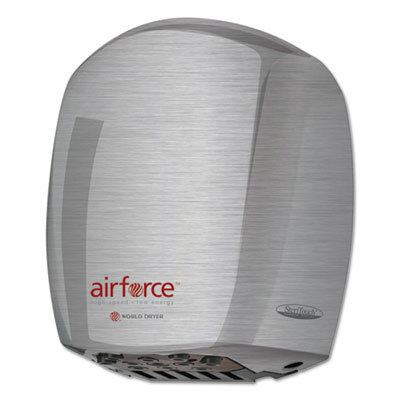 Airforce is an environmentally-friendly ambient temperature hand dryer. Airforce is manufactured with patented SteriTouch� antimicrobial technology inhibiting the growth of bacteria, mold and fungus extending the dryer's service life. Its modern sleek design complements any washroom d�cor. Material(s): Stainless Steel; Color(s): Brushed; Width: 10 3/4�; Depth: 9". 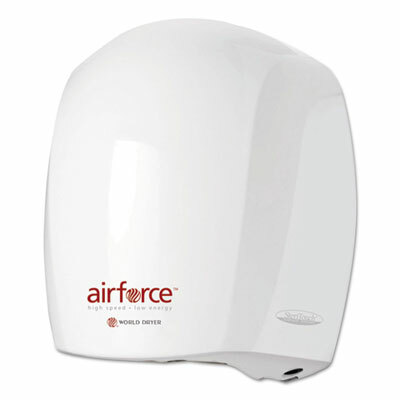 Airforce is an environmentally-friendly ambient temperature hand dryer. Airforce is manufactured with patented SteriTouch� antimicrobial technology inhibiting the growth of bacteria, mold and fungus extending the dryer's service life. 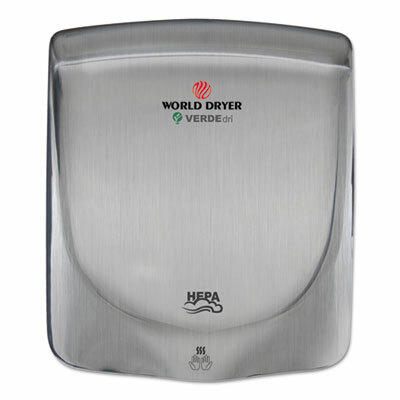 Its modern sleek design complements any washroom d�cor. Material(s): Aluminum; Color(s): White; Width: 10 3/4�; Depth: 9". 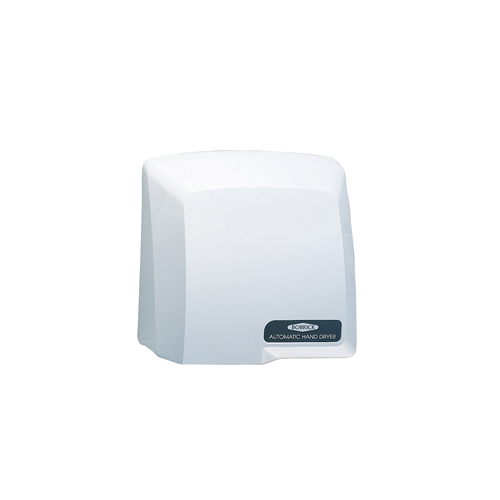 SMARTdri� Series high-speed hand dryers are the most energy efficient, durable and hygienic hand dryers on the market today. 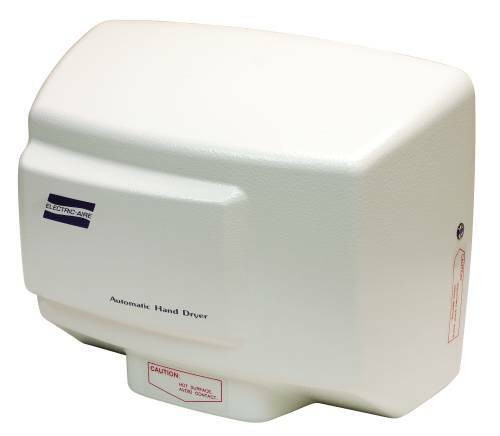 SMARTdri's proprietary motor technology offers the longest service life of any high-speed hand dryer. The intelligent, flexible controls allow customizing of air flow, sound quality and heating options to fit any application. High intensity. 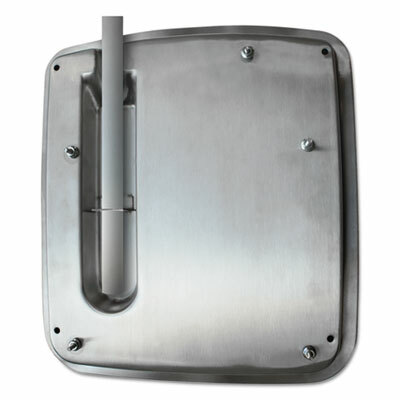 Material(s): Stainless Steel; Color(s): Brushed; Width: 12 1/2"; Depth: 9 3/8".